2 "When I seize the set time, I, I judge [in] equity. 3 Dissolved [in fear] are earth and its inhabitants: I, I set firm its pillars. Selah. 5 Lift not up your horn on high; Speak not with stiff neck." 6 For not from east, nor from west, And not from the wilderness is lifting up. 7 For God is judge: This one He abases, and that one He lifts up. 8 For a cup is in the hands of Jehovah, And it foams with wine; it is full of mixture, And He pours out from it: Yea, its dregs shall all the wicked of the earth gulp down and drink. 9 And as for me, I will declare [it] for ever, I will harp to the God of Jacob. 10 And all the horns of the wicked will I cut off: Exalted shall be the horns of the righteous. This psalm deals with the general thought of God's judgment in history, especially on heathen nations. It has no clear marks of connection with any particular instance of that judgment. The prevalent opinion has been that it refers, like the next psalm, to the destruction of Sennacherib's army. There are in it slight resemblances to psalm xlvi., and to Isaiah's prophecies regarding that event, which support the conjecture. Cheyne seems to waver, as on page 148 of "Orig. of Psalt." 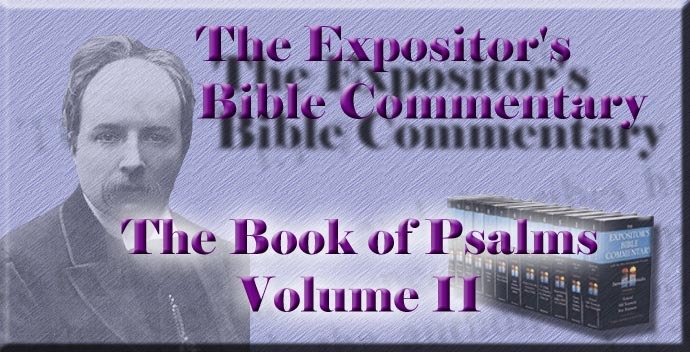 he speaks of "the two Maccabean psalms, lxxiv. and lxxv.," and on page 166 concludes that they "may be Maccabean, . . . but we cannot claim for this view the highest degree of probability, especially as neither psalm refers to any warlike deeds of Israelites. It is safer, I think, to . . . assign them at the earliest to one of the happier parts of the Persian age." It is apparently still safer to refrain from assigning them to any precise period. The kernel of the psalm is a majestic Divine utterance, proclaiming God's judgment as at hand. The limits of that Divine word are doubtful, but it is best taken as occupying two pairs of verses (2-5). It is preceded by one verse of praise, and followed by three (6-8) of warning spoken by the psalmist, and by two (9, 10,) in which he again praises God the Judge, and stands forth as an instrument of His judicial acts. In ver. 1, which is as a prelude to the great Voice from heaven, we hear the nation giving thanks beforehand for the judgment which is about to fall. The second part of the verse is doubtful. It may be taken thus: "And Thy name is near; they (i.e., men) declare Thy wondrous works." So Delitzsch, who comments: The Church "welcomes the future acts of God with fervent thanks, and all they that belong to it declare beforehand God's wondrous works." Several modern scholars, among whom are Grätz, Baethgen, and Cheyne, adopt a textual alteration which gives the reading, "They who call upon Thy name declare," etc. But the rendering of the A.V., which is also that of Hupfeld and Perowne, gives a good meaning. All God's deeds in history proclaim that He is ever at hand to help. His name is His character as revealed by His self-manifestation; and this is the glad thanks-evoking lesson, taught by all the past and by the judicial act of which the psalm is the precursor--that He is near to deliver His people. As Deut. iv. 7 has it, "What nation is there that hath God so near unto them?" The Divine voice breaks in with majestic abruptness, as in Psalm xlvi. 10. It proclaims impending judgment, which will restore society, dissolving in dread or moral corruption, and will abase insolent wickedness, which is therefore exhorted to submission. In ver. 2 two great principles are declared--one in regard to the time and the other in regard to the animating spirit of God's judgment. Literally, the first words of the verse run, "When I lay hold of the appointed time." The thought is that He has His own appointed time at which His power will flash forth into act, and that till that moment arrives evil is permitted to run its course, and insolent men to play their "fantastic tricks" before an apparently indifferent or unobserving God. His servants are tempted to think that He delays too long; His enemies, that He will never break His silence. But the slow hand traverses the dial in time, and at last the hour strikes and the crash comes punctually at the moment. The purposes of delay are presented in Scripture as twofold: on the one hand, "that the long-suffering of God may lead to repentance"; and on the other, that evil may work itself out and show its true character. To learn the lesson that, "when the set time is come," judgment will fall, would save the oppressed from impatience and despondency and the oppressor from dreams of impunity. It is a law fruitful for the interpretation of the world's history. The other fundamental truth in this verse is that the principle of God's judgment is equity, rigid adherence to justice, so that every act of man's shall receive accurately "its just recompense of reward." The "I" of ver. 2 b is emphatic. It brings to view the lofty personality of the Judge, and asserts the operation of a Divine hand in human affairs, while it also lays the basis for the assurance that, the judgment being His, and He being what He is, it must be "according to truth." Such a "set time" has arrived, as ver. 3 proceeds to declare. Oppression and corruption have gone so far that "the earth and its inhabitants" are as if "dissolved." All things are rushing to ruin. The psalmist does not distinguish between the physical and the moral here. His figure is employed in reference to both orders, which he regards as indissolubly connected. Possibly he is echoing Psalm xlvi. 6, "The earth melted," though there the "melting" is an expression for dread occasioned by God's voice, and here rather refers to the results of "the proud man's wrong." At such a supreme moment, when the solid framework of society and of the world itself seems to be on the point of dissolution, the mighty Divine Personality intervenes; that strong hand is thrust forth to grasp the tottering pillars and stay their fall; or, in plain words, God Himself then intervenes to re-establish the moral order of society, and thus to save the sufferers. (Comp. Hannah's song in 1 Sam. ii. 8.) That intervention has necessarily two aspects, being on the one hand restorative, and on the other punitive. Therefore in vv. 4 and 5 follow Divine warnings to the "fools" and "wicked," whose insolent boasting and tyranny have provoked it. The word rendered "fools" seems to include the idea of boastfulness as well as folly in the Biblical sense of that word, which points to moral rather than to merely intellectual aberration. "Lifting up the horn" is a symbol of arrogance. According to the accents, the word rendered "stiff" is not to be taken as attached to "neck", but as the object of the verb "speak," the resulting translation being, "Speak not arrogance with a [stretched out] neck"; and thus Delitzsch would render. But it is more natural to take the word in its usual construction as an epithet of "neck", expressive of superciliously holding a high head. Cheyne follows Baethgen in altering the text so as to read "rock" for "neck"--a slight change which is supported by the LXX. rendering ("Speak not unrighteousness against God")--and renders "nor speak arrogantly of the rock." Like the other advocates of a Maccabean date, he finds here a reference to the mad blasphemies of Antiochus Epiphanes; but the words would suit Rabshakeh's railings quite as well. The exact point where the Divine oracle passes into the psalmist's own words is doubtful. Ver. 7 is evidently his; and that verse is so closely connected with ver. 6 that it is best to make the break at the end of ver. 5, and to suppose that what follows is the singer's application of the truths which he has heard. Two renderings of ver. 6 b are possible, which, though very different in English, turn on the minute difference in the Hebrew of one vowel sign. The same letters spell the Hebrew word meaning mountains and that meaning lifting up. With one punctuation of the preceding word "wilderness," we must translate "from the wilderness of mountains"; with another, the two words are less closely connected, and we must render, "from the wilderness is lifting up." If the former rendering is adopted, the verse is incomplete, and some phrase like "help comes" must be supplied, as Delitzsch suggests. But "lifting up" occurs so often in this psalm, that it is more natural to take the word in that meaning here, especially as the next verse ends with it, in a different tense, and thus makes a sort of rhyme with this verse. "The wilderness of mountains," too, is a singular designation, either for the Sinaitic peninsula or for Egypt, or for the wilderness of Judah, which have all been suggested as intended here. "The wilderness" stands for the south, and thus three cardinal points are named. Why is the north omitted? If "lifting up" means deliverance, the omission may be due to the fact that Assyria (from which the danger came, if we adopt the usual view of the occasion of the psalm) lay to the north. But the meaning in the rest of the psalm is not deliverance, and the psalmist is addressing the "foolish boasters" here and that consideration takes away the force of such an explanation of the omission. Probably no significance attaches to it. The general idea is simply that "lifting up" does not come from any quarter of earth, but, as the next verse goes on to say, solely from God. How absurd, then, is the self-sufficient loftiness of godless men! How vain to look along the low levels of earth, when all true elevation and dignity come from God! The very purpose of His judicial energy is to abase the lofty and raise the low. His hand lifts up, and there is no secure or lasting elevation but that which He effects. His hand casts down, and that which attracts His lightnings is "the haughtiness of man." The outburst of His judgment works like a volcanic eruption, which flings up elevations in valleys and shatters lofty peaks. The features of the country are changed after it, and the world looks new. The metaphor of ver. 8, in which judgment is represented as a cup of foaming wine, which God puts to the lips of the nations, receives great expansion in the prophets, especially in Jeremiah, and recurs in the Apocalypse. There is a grim contrast between the images of festivity and hospitality called up by the picture of a host presenting the wine cup to his guests, and the stern compulsion which makes the "wicked" gulp down the nauseous draught held by God to their reluctant lips. The utmost extremity of punitive inflictions, unflinchingly inflicted, is suggested by the terrible imagery. And the judgment is to be world-wide; for "all the wicked of the earth" are to drink, and that to the dregs. And how does the prospect affect the psalmist? It moves him, first, to solemn praise--not only because God has proved Himself by these terrible things in righteousness to be the God of His people, but also because He has thereby manifested His own character as righteous and hating evil. It is no selfish nor cruel joy which stirs in devout hearts, when God comes forth in history and smites oppressing insolence. It is but a spurious benevolence which affects to recoil from the conception of a God who judges and, when needful, smites. This psalmist not only praised, but in his degree vowed to imitate. The last verse is best understood as his declaration of his own purpose, though some commentators have proposed to transfer it to the earlier part of the psalm, regarding it as part of the Divine oracle. But it is in its right place where it stands. God's servants are His instruments in carrying out His judgments; and there is a very real sense in which all of them should seek to fight against dominant evil and to cripple the power of tyrannous godlessness.